Collapsing polar ice caps, a green Sahara Desert, a 20-foot sea-level rise. That’s the potential future of Earth, a new study suggests, noting that global warming could be twice as warm as current climate models predict. The rate of warming is also remarkable: “The changes we see today are much faster than anything encountered in Earth’s history. In terms of rate of change, we are in uncharted waters,” said study co-author Katrin Meissner of the University of New South Wales in Australia. This could mean the landmark Paris Climate Agreement – which seeks to limit global warming to 2 degrees Celsius (3.6 degrees Fahrenheit) above pre-industrial levels – may not be enough to ward off catastrophe. 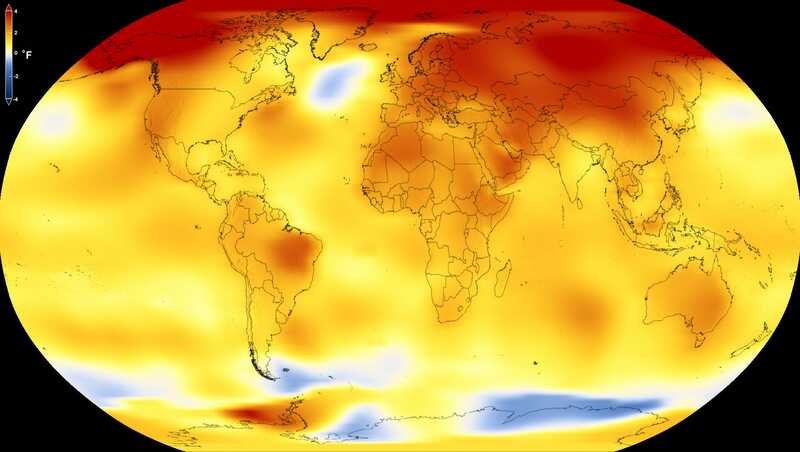 “Even with just 2 degrees of warming – and potentially just 1.5 degrees – significant impacts on the Earth system are profound,” said study co-author Alan Mix, a scientist from Oregon State University. “We can expect that sea-level rise could become unstoppable for millennia, impacting much of the world’s population, infrastructure and economic activity,” Mix said. In looking at Earth’s past, scientists can predict what the future will look like. In the study, the researchers looked back at natural global warming periods over the past 3.5 million years and compared them to current man-made warming. By combining a wide range of measurements from ice cores, sediment layers, fossil records, dating using atomic isotopes and many other established paleoclimate methods, the researchers pieced together the impact of those climatic changes. Human-inflicted climate change is caused by the burning of fossil fuels such as coal, oil and gas, which release heat-trapping greenhouse gases such as carbon dioxide and methane into the the atmosphere. Study lead author Hubertus Fischer of the University of Bern in Switzerland and his team found that our current climate predictions may underestimate long-term warming by as much as a factor of two. The research also revealed how large areas of the polar ice caps could collapse and significant changes to ecosystems could see the Sahara Desert become green and the edges of tropical forests turn into fire-dominated savanna. The study, which was conducted by dozens of researchers from 17 countries, was published last week in Nature Geoscience, a peer-reviewed British journal.